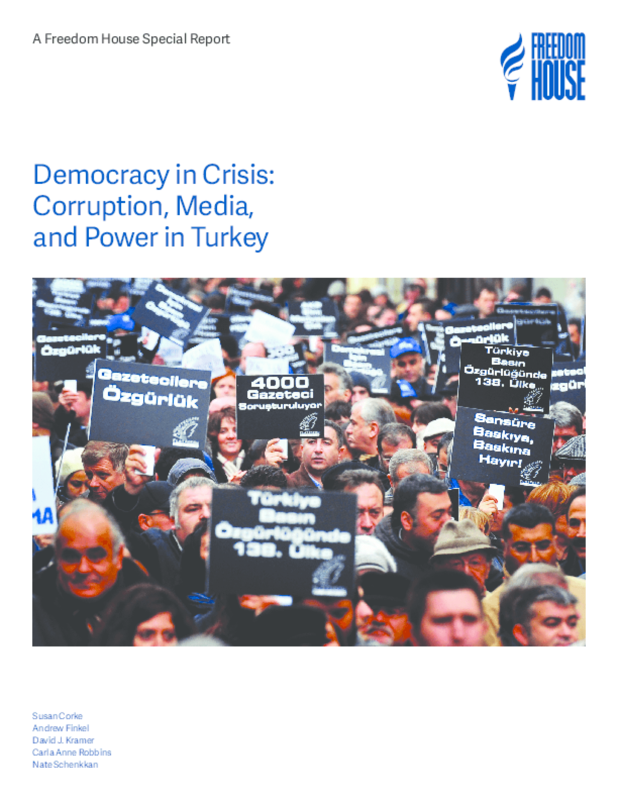 In November 2013, a Freedom House delegation traveled to Turkey to meet with journalists, NGOs, business leaders, and senior government officials about the deteriorating state of media freedom in the country. The delegation's objective, and the plan for this report, was to investigate reports of government efforts to pressure and intimidate journalists and of overly close relationships between media owners and government, which, along with bad laws and overly aggressive prosecutors, have muzzled objective reporting in Turkey. Since November, events in Turkey have taken a severe turn for the worse. The police raids that revealed a corruption scandal on December 17, and the allegations of massive bidrigging and money laundering by people at the highest levels of the government, have sparked a frantic crackdown by the ruling Justice and Development (AK) Party. More journalists have been fired for speaking out. Hundreds of police officers and prosecutors have been fired or relocated across the country. Amendments to the new Internet regulation law proposed by the government would make it possible for officials to block websites without court orders. The government is also threatening the separation of powers by putting the judiciary, including criminal investigations, under direct control of the Ministry of Justice. The crisis of democracy in Turkey is not a future problem -- it is right here, right now. Intimidation: Prime Minister Recep Tayyip Erdo?an frequently attacks journalists by name after they write critical commentary. In several well-known cases, like those of Hasan Cemal and Nuray Mert, journalists have lost their jobs after these public attacks. Sympathetic courts hand out convictions in defamation cases for criticism. Mass firings: At least 59 journalists were fired or forced out in retaliation for their coverage of last summer's Gezi Park protests. The December corruption scandal has produced another string of firings of prominent columnists. Buying off or forcing out media moguls: Holding companies sympathetic to the government receive billions of dollars in government contracts, often through government bodies housed in the prime minister's office. Companies with media outlets critical of the government have been targets of tax investigations, forced to pay large fines, and likely disadvantaged in public tenders. Wiretapping: The National Security Organization has wiretapped journalists covering national security stories, using false names on the warrants in order to avoid judicial scrutiny. These tactics are unacceptable in a democracy. They deny Turkish citizens full access to information and constrain a healthy political debate. Journalists and government officials alike acknowledge that reporters and news organizations have practiced self-censorship to avoid angering the government, and especially Prime Minister Erdogan. The intentional weakening of Turkey's democratic institutions, including attempts to bully and censor Turkey's media, should and must be a matter of deep concern for the United States and the European Union. As the AKParty's internal coalition has grown more fragile, Erdogan has used his leverage over the media to push issues of public morality and religion and to squelch public debate of the accountability of his government. The result is an increasingly polarized political arena and society. Repeal the criminal defamation law and overly broad antiterrorism and "criminal organization" laws that have been used to jail dozens of journalists. Comply with European and international standards in procurement practices in order to reduce the incentive for media owners to curry favor by distorting the news. Turkish media owners themselves must make a commitment to support changes in procurement practices if they are to win back the trust of Turkey's citizens. Although building a resilient democracy is fundamentally up to Turkish citizens, the international community cannot afford to be bystanders. The European Union and the OSCE have raised strong concerns about government pressure on Turkey's media, and the EU's warnings against governmental overreach have been pointed. Unfortunately, the same cannot be said for the United States. The Obama administration has been far too slow to realize the seriousness of the threat to Turkey's democracy. U.S. criticism of the Turkish government's recent actions has come from the State Department spokesperson and White House press secretary, not from the high-ranking officials who need to be engaged in responding to a crisis of this scale. Where European governments and institutions have been specifically and publicly engaged with the government over the crisis, the Obama administration has avoided the difficult issues. It is time to speak frankly and with seriousness about the growing threat to democracy in Turkey, and to place freedom of expression and democracy at the center of the policy relationship.